This last weekend I went to stay with Heather out in Palm Desert (per usual) and it was hot (per usual!). Summer has definitely started out in the desert. Both Saturday and Sunday were 104° yet it felt like 120°. On Sunday we went to the last Vintage Market of the season over in Palm Springs, and we slacked and didn’t get there until 10:30am when it was already around 95°. We browsed the flea market faster than we ever have because we felt like dying. When we were done we headed to downtown just to get pineapple Dole Whip from Lappert’s Ice Cream. We had been talking about getting this all weekend. Have you ever had the Dole Whip from Disneyland? It is the place by the Tiki Room that has the longest line? IT IS THE SAME STUFF! I probably could have eaten an entire pint by myself, but we were good and got smalls. It was the perfect thing to cool us down. Aside from the Dole Whip, I was super excited to wear this outfit! These are now my fourth pair of high waist denim shorts from Topshop, the “Mom” shorts I have mentioned before (all of which I have bought on sale). I just couldn’t help it with the cute little embroidered flowers! I love that the embroidery isn’t too loud on these. When I originally planned this outfit I wasn’t sure what top I wanted to wear and I was in a rush so I just grabbed this sleeveless button-up from Target. It ended up working quite nicely, besides I love mixing stripes and floral prints. I first tried to easy-tuck the front but that just looked weird, so I tied it instead. It ended up perfect! Find the shorts by Topshop from Nordstrom here, a couple similar tanks from Target are linked here and here, and the sunglasses are BP from Nordstrom linked here! Enjoy and happy Tuesday! Two Sundays ago, my sister, niece and I went on a little adventure down to The Flower Fields in Carlsbad! I kept seeing photos on Instagram of this place so of course I wanted to go, basic as charged. I didn’t realize when I looked it up though that it was an actual place. That seems silly that I thought it was just a flower field people found, but oh no, it is a real place with vendors and admission to get in (it is $16 for adults but you get $1 off with AAA WOOO! $8 for kiddos). We drove the hour+ to go down there, yes just to take cute photos with flowers and I totally think it was worth it. These fields are huge! They go on for so long. Another silly aspect, yet again I was surprised with how many people were there with the same intentions as us. I need to get over the fact that half of my ideas are not really just mine. Instagram is full of influencers and it works, I get influenced all the time! Taking photos in the middle of the flowers was a bit of a challenge because there is caution tape warning you against crossing. The warning was no joke as a fierce old man drove up to the girl next to us who dared to cross the green line and yelled at her and asked if she could read what it said. Tip to take a photo along the edge: squat low enough so your whole picture frame is flowers, doubles as leg day. Down the center rows, little paths jut into the fields, with green caution tape of course, so you can get a photo actually in the fields. Those posed a bit of a challenge as well. There are like 100 people behind you also waiting to take a photo so you feel pressure, and waiting for your position (either corner or center on the bench) needs to be planned according to the sun. We planned poorly because we got a bunch of shadow on our faces but it was okay. All in all it was a fun little girls’ day and I recommend it if you have nothing to do or want super cute photos. Another tip: wear sunscreen even if it is overcast… I got burned. Third tip: buy the kettle corn. Go be basic and check out the fields! It closes this month! As I am sure you have noticed, ruffles are becoming a pretty big trend right now. I have been dabbling a little, but I have been noticing myself being drawn more and more to them. Last month, another blogger I follow was wearing this pink striped off the shoulder top and I thought it was so cute! I checked the online shop where she bought it from, SheIn, and it was only $14! Clearly I had to buy one. I also found these white hight waist “mom” shorts from Topshop at Nordstrom. The two paired together perfectly! I wore it to brunch with two of my girlfriends and everyone loved it. It sounds silly but I really loved the big ruffle because it made me feel so fancy! Check it out below! I love when you see an outfit you want to recreate, and then you successfully do it! 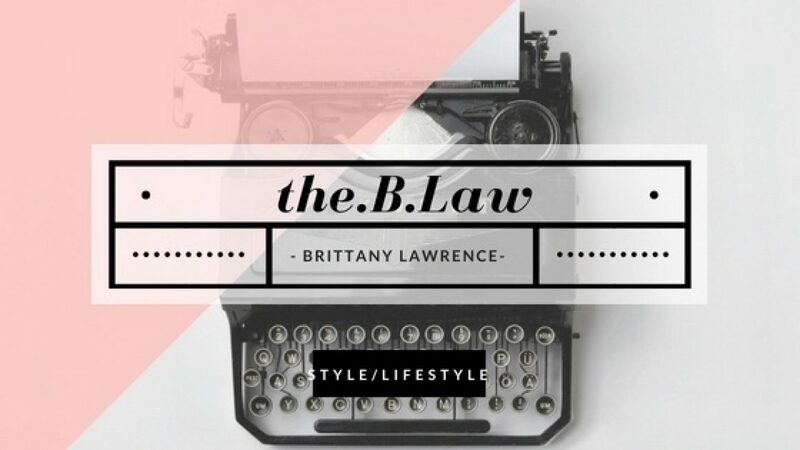 I was on the Bloguettes’ website and saw it, a blue and white thin striped button up, with a tan blazer, and white pants, simple. I thought how great it would be for work, so different than the usual black, gray, or navy slacks. Spring is Monday and it’s time to brighten things up! I already had white pants (they are technically jeans so I need to invest in some white slacks) and a tan blazer, I just needed the button up. Strolling through Target, I found it! When I put the whole combo on together it looked even better than I thought. I like that both the button up and the blazer are kind of oversized, although I do want to find a normal length tan blazer, any suggestions?! I could probably hide the fact that these are jeans at work but I’ll just keep it as a casual Friday outfit until I get slacks. For any of you who follow my Instagram (@the.B.Law) you’ve seen my recent new obsession, Knox Rose at Target. This line has just gotten me so excited! The style is mostly boho, yet some are only slightly boho, if that even makes sense. I have been getting more into this style lately thanks to my Roomie, thanks girl! In this short time span I have acquired four new pieces from the line… oops? Two were on sale though so it is okay…actually all four were on sale so it’s definitely okay! Anyways let’s check it out! The first one I got was this tank that I like to call my indian top but it is actually named the Embroidered Tank Top in cream. You’ll see what I mean when you see the embroidery. I LOVE this tank! It has the cutest fringe detail on the bottom and is pretty long on, but not too long where it looks weird with shorts. 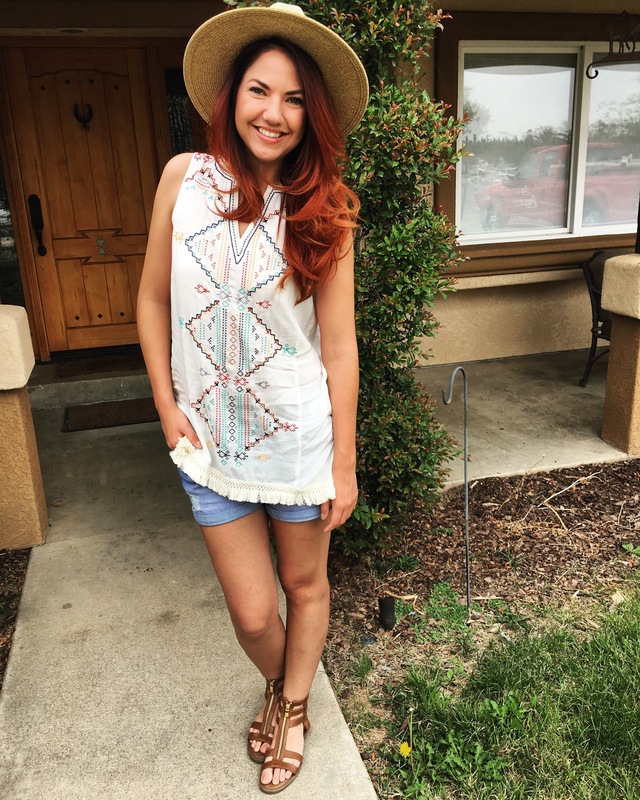 On Memorial Day weekend I wore it with my boyfriend shorts from Old Navy, and my new Gladiator sandals and hat both from Target as well. The second top I got, well actually I bought the first tank, the gladiator sandals, and this second top together because they were all 30% for Memorial Day weekend. This top is too cute! I love it because it is kind of different. This is one of the examples of how some of the Knox Rose pieces can be slightly boho. 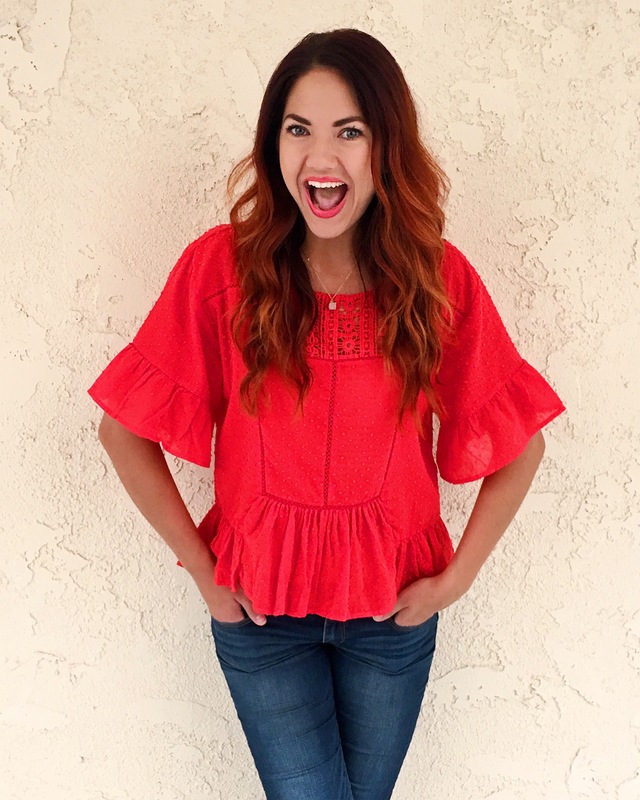 The ruffle peasant arms and ruffle peplum bottom make this top feel so girly! There is also a subtle polkadot detail on the entire top that is in the same color as the rest of the fabric however it is textured, you can feel the polkadots. The crocheted neck helps to keep the boho feel. Also how awesome is this bright red?! I recently discovered that I can actually can wear red with red hair, and I like it! I am wearing red this weekend too but that is for a different post! This third piece I found this past Friday and was on the clearance rack for $19! It is something I normally wouldn’t wear but I fell in love! It is perfect to add a little something to your outfit! I cannot wait to figure out what I can wear this white and indigo Tie Dye Vest with next! It is just so fun, I wore it to the zoo on Saturday when I went with my boyfriend’s mom, sister, and nephew. 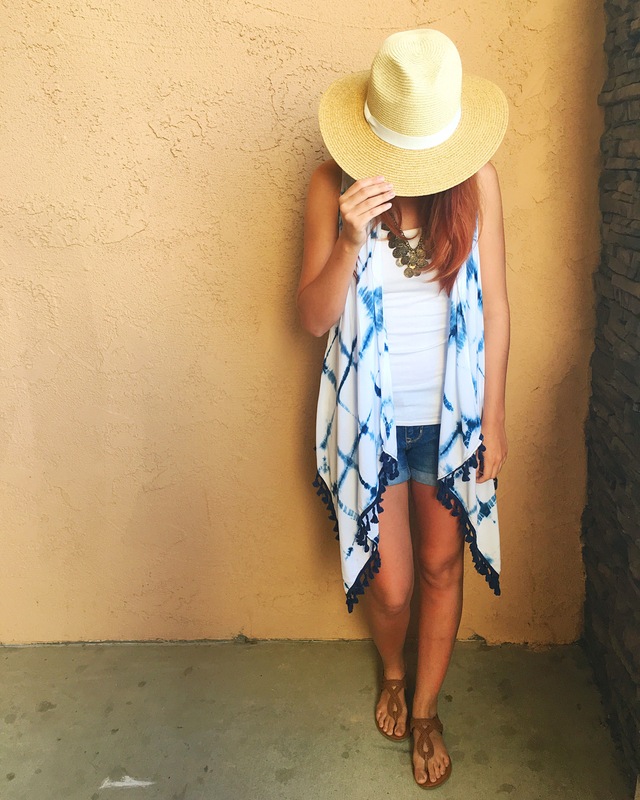 It is the perfect addition to a simple and casual summer outfit to do just about anything in! Lastly I found a beige oversized knit cardigan on the clearance rack for $8! I recently just discovered why it was on clearance as my thumb went into a hole but it is okay. The hole is in the seam and totally fixable so it was so worth the $8. It is so soft and comfortable I wore it all day at work yesterday and never wanted to take it off! The color is so perfect to literally go over anything. 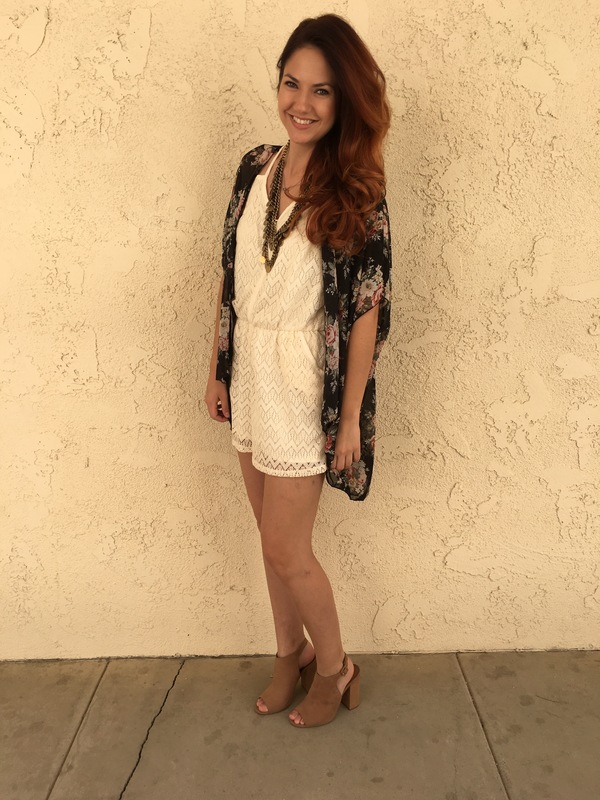 I didn’t get a picture yet but you can check it out here: Layering Knit Top with Crochet in Beige – Knox Rose at Target. 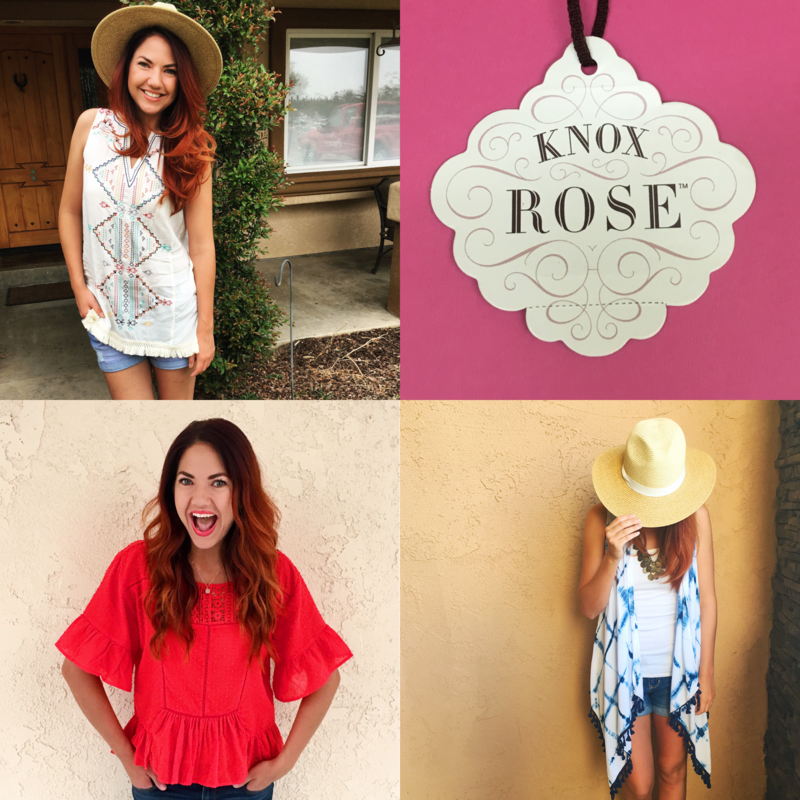 If you haven’t done so, go check out the Knox Rose line at Target you really won’t regret it! I already have my eye on a couple of other items!